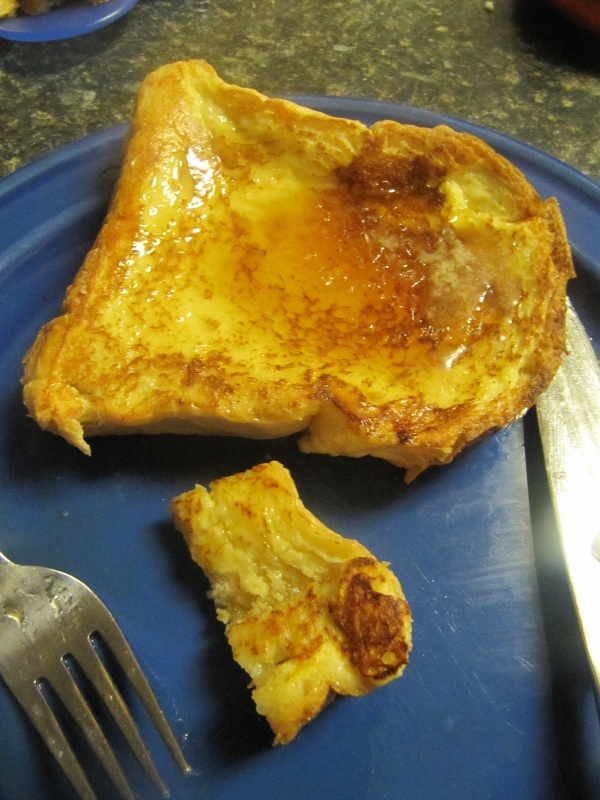 I’ve waxed previously about my enjoyment of french toast but my recipe always seemed a little too simple: nothing to elevate it to wonderment. Luckily that’s changed. I came across a recipe recently for pancakes that used brown sugar; I had to break it down and mix it into my dry ingredients by hand but it added a great dimension. I liked the idea of orange juice in the mix but it made the final taste too acidy and not custardy enough. Zesting a little lemon or orange into the mix add just the right note of citrus and adding brown sugar instead of white took it over the top. The following recipe is for two regular slices of bread and is a single serving for an adult. I like to cut my own 1.5-2″ slices and use the following per slice; just multiply and use a larger shallow vessel. Don’t use a bowl if you can help it since the bread can’t soak the mixture evenly. Combine ingredients and whisk thoroughly in a shallow vessel. Add bread to mixture until well soaked and flip. Add to a frying pan on medium low heat and flip when golden brown. Remove to plate when golden brown on both sides: liberally slather with butter and real maple syrup.